The interaction between drugs and food is an increasingly relevant topic in clinical practice. There are numerous possibilities for interactions between drugs and food, often unknown or ignored by both health professionals and patients. The success of the care given to each patient depends, to a large extent, on the knowledge regarding the risks of associating drugs and foods. These interactions can be decisive in achieving therapeutic success due to interferences not only in the pharmacokinetics and pharmacodynamics of the drugs, with direct implications in the effectiveness and safety of the drugs, as well as in the absorption of nutrients. This aspect becomes even more relevant in patients with chronic pathology in which the coexistence of the drug/food binomial is prolonged over time. 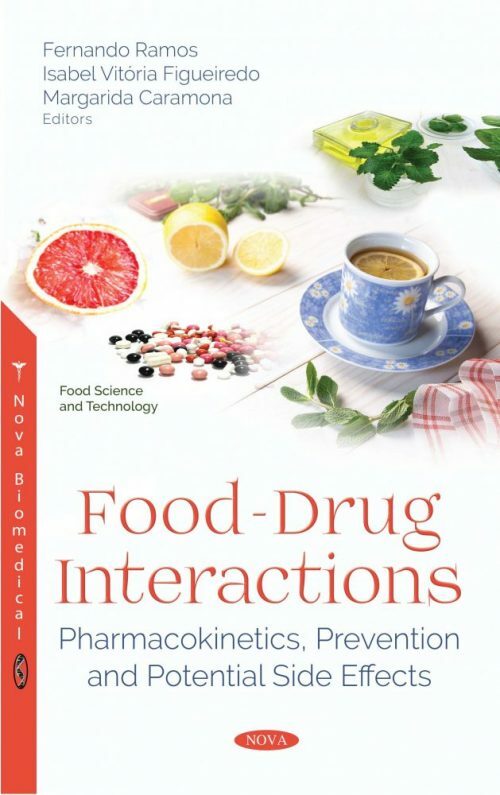 The objective of this book was to carry out a review on the main drug-food interactions and their impact on health. In this book, the most prevalent chronic pathologies in the population are referenced. In addition to an introductory chapter on this subject, the following chapters address the impact of the vehicles used in the different pharmaceutical formulations for the oral route. Taking this into account, aspects of potential interactions in the digestive and hepatic system, in diseases such as diabetes mellitus, chronic kidney disease, heart disease, dyslipidemia and cancer disease are presented. Additionally, the relevance of interactions between drugs and products of plant origin are also described. Finally, the authors present a “case study”, with the main focus on the evaluation of potent interactions between antihypertensive and anti-dyslipidemic drugs and foods, carried out in a community pharmacy. The authors believe that this book is of general interest, with greater relevance to health professionals, namely doctors, pharmacists, nurses and nutritionists, in order to facilitate quicker assessments of potential interactions and risks arising from the prescription of medicines and concomitant use with food.